As per Sthalapurana, Vaishampayana was telling stories of Bhagavatam to Janamejaya Maharaja. He was referring to Lord Krishna's visit to Hastinapura as Pandava's Dhoota to plead for their rightful share and about the Lord's Vishwaroopa. Desiring to have the darshan of Vishwaroopa, they performed the Ashwamedayagna at Kanchi. On completion of Poornahooti, the Lord gave darshan as Pandava Dhoota. Thirumangaialwar - 1541, 2674 (127). Very near to Ekambareshwarar Temple, Periya Conjeevaram. 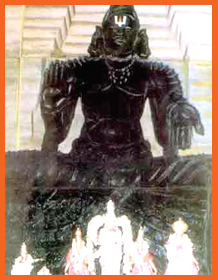 The Moolavar of this sthalam is Pandava Thoodhar. He is found i Irundha (sitting) thirukkolam, facing East direction. Prathyaksham for Janamejayan and Hareetha Munivar. This Divyadesam is also considered to be an important Divyadesam in Kanchipuram. It is situated near to Ekambareshwarar temple in Big Kanchipuram. It is near to Gangai Kondaan Mandapam.